Look, I get it—we can sometimes ask for a lot! But when it comes to something as big as building a content management system, of course your marketing team is going to have a lot to say. They are the ones, after all, who will interact with the CMS the most out of your team. Suffice it to say, your CMS plays a major role in your content marketing strategy. So what features will be the most useful to your marketing team and goals? And more importantly, how can you ensure that as your strategy evolves, your CMS can keep up? First, let’s dive into the things that no one managing a website or app can live without. If your developer skips over these or the platform you’ve chosen doesn’t come with them out of the box, it’s time to seriously reconsider a replacement. WYSIWYG Page Editing­ – There’s nothing more frustrating than not being able to format copy easily. A what-you-see-is-what-you-get (WYSIWYG) editor will enable quick and painless editing without having to slog through code or ask a developer to help you. Embeddable Media – Shrinking attention spans and basic best practices mean that content needs to include images, videos, audio clips, embedded media, and more. Being able to insert these features on the fly will expand your creative possibilities. Revision Management – Nothing on a website is ever set in stone, so being able to revert back to previous versions of a page is very helpful when you are either a) testing iterations of your content or b) sharing editing capabilities with multiple people. Meta Data / SEO – It’s nearly 2018. There is no excuse for your content not to be optimized for search engines. So why not make it easy to set your meta data per page? Of course, everything beyond the basics varies case by case, and it will likely change over time. But based on our experience working with many different CMOs, marketing managers, and content marketing teams, there are a few that come up often. Pre-defined user roles can be a blessing when you want more control over your CMS. When you customize what each team member has access to, you can avoid issues down the line. Some marketing teams are a caffeine-fueled team of one, and others are an entire phalanx of copywriters, social media managers, SEO specialists, and data analysts. Add to that sales people, developers, and anyone else who needs to access the back end, and you’re going to have a lot of cooks in the kitchen. Then someone has touches something they shouldn’t. Now you’ve got a mess on your hands. When everyone has access to everything, it’s hard to keep track of what they’re all doing. This isn’t to say that you can’t trust your team, or that they’re not communicating with each other. But when there’s a big product launch or marketing initiative going on, things can get hectic and wires can get crossed. One way of mitigating that risk is to make sure everyone has access only to CMS tools relevant to their role. That way, the wires are neatly organized (so to speak) and there’s a certain level of accountability involved when something goes wrong. Not only that, but well-defined access can actually make marketers’ lives easier. They have a lot on their plates, so being able to log in and go straight to the tools they need without having to click through a bunch of other stuff can help streamline their tasks. And trust me, there’s nothing that a marketer loves more than something that saves time. A well-oiled content marketing team usually has a set of processes in place that helps them create, review, and publish content efficiently and consistently. Your CMS should have tools that help streamline these processes, not hinder them. The article is published and shared via social media, email, etc. Imagine, then, how much more efficient your team might be if they didn’t have to leave your CMS to achieve all of these things. It’s worth mentioning that a lot of the out-of-the-box CMSs out there may only achieve 50-60% of this without the help of third-party integrations and plugins. But as you start to veer more toward the custom side, the sky is the limit in terms of what writing, review/approval, status tracking, and publishing tools you can build directly into the admin. As I mentioned before, a good content marketing strategy includes more than just copy. Especially with the increased emphasis on video these days, marketers need to diversify their output—and it needs to stay organized. A great CMS will include a media library or some other kind of system that can not only take multiple file types, but allow your team to easily sort and access them. To its credit (even though we throw a lot of shade on this blog), WordPress has a decent built-in media library that can achieve this for the most basic asset types such as images, videos, audio, and even documents. It’s easily accessible from the WYSIWYG, and even allows you to input some meta data. Beyond this, if you do more than just insert media into blog posts, your CMS could serve as a sophisticated filing system that allows your team to index and categorize all of their content. In fact, well-built asset management system could also benefit your other teams. Imagine having a beautifully organized library where your sales team can access important sales documents, decks, and product photos in a few clicks. Or if you have franchisees, you can create a central hub of brand materials they can use to expand their own marketing efforts. See? What benefits the marketers can benefit everyone! Nowadays, even small to mid-sized organizations are picking up on the fact that a lone website sitting out in the void isn’t enough to drum up business. Additionally, people don’t consume content in one place anymore—new technologies have expanded our digital world view to include multiple devices, social media, and a complex web of overlapping providers. As such, companies (and their marketers) have had to diversify the channels through which their content is published. We’ve written a lot about the concept of a headless or decoupled CMS. While it sounds pretty technical and is usually the domain of developers and IT teams, building your platform this way does, in fact, benefit your content marketers. Let’s assume, for example, that you are a publisher of news videos. These videos don’t just go up on your website, but are also distributed to multiple displays (e.g. apps, OTT, etc. ), other websites, and social media platforms. And the way they’re displayed varies by channel. Rather than logging into many different platforms, they can create all of the relevant content around each video right in the CMS and send it out to the world in a single click. Technically, this will only shave off a few minutes here or there per piece. But multiply those few minutes by multiple team members. And multiply that number by however many videos you publish in a day or even a month, plus time that might be spent editing and updating if anything changes in the future. In the end, you could potentially save your marketing team hours of time they could spend creating more, better content. No matter how big or small your marketing team is, someone needs to pay attention to your analytics. You can’t know if your efforts are effective if you’re not tracking the outcome. Consumption Metrics: site traffic, channel distribution, browsing depth, etc. Lead Metrics: how many leads, what content is converting them, etc. Sales Metrics: conversion rates, cost of acquisition, content ROI, etc. For marketers, this type of information is priceless. It informs your team whether the content they’re creating is effective or not, which can help them pivot with ease to build better, more effective campaigns over time. But there are a lot, and I mean A LOT of different analytics tools out there, starting with the almighty Google Analytics (pictured above). Plus, many marketing software providers include their own metrics and can integrate with a CRM to cross-reference sales data. Awesome and powerful, yes, but also just more and more things marketers have to log into every day. So, imagine if your CMS could consolidate all of this data in one nice, neat dashboard for them. For example, a custom-built CMS could have the ability to connect with multiple APIs and pull data from various sources regarding things like traffic, leads, referrals, and shares. Then you can design charts and tables for your dashboard specific to your team’s reporting needs, allowing them to see everything they need to know at a moment’s notice on one user-friendly screen. A huge part of this is figuring out from the onset what metrics and data are the most valuable, not just to your marketing team but to the organization at large. This is an incredibly important part of the project discovery process, which is why it’s so important to involve your marketers early on (or at least keep them in mind!). Finally, we look to the future. In the marketing world, trends and universally accepted best practices come and go. We also evolve a lot over time, learning from our mistakes as well as our successes. This allows us to come up with bigger, better strategies and processes over time. As such, there needs to be a certain amount of flexibility built into your CMS to keep up. There is a good chance that your marketing team will need something a few months or maybe even a few years down the line that didn’t occur to anyone during the original architecture process. Does your CMS give you the freedom to add tools and workflows without adding bloat? Furthermore, depending on where your company is in its lifecycle, the size of your team might grow exponentially over time, and they might start generating more and more content that needs to be managed and distributed properly. Can your CMS grow too? Or do you run the risk of it becoming a disorganized mess of plugins and unsorted media files? Your content management system can be one of your organization’s greatest assets—and so can your content marketing team. Yes, they might ask for a lot. And yes, if you ask them how they’re doing, they might bore you with the minutiae of their 50,000 daily tasks or give you a grammar lesson you didn’t ask for. But given the right tools, they can also fuel the entire core of your digital ecosystem in a way that can grow your business and help you reach the farthest corners of the Web. So cut them a bit of slack! 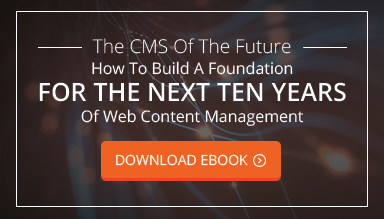 Consider including some (if not all) of the features we’ve outlined today, not just to make your marketers’ lives easier, but to build the best CMS for the overall success of your organization.